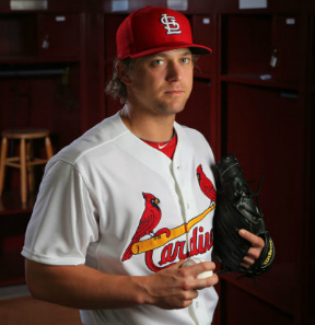 Should We Be Concerned About Trevor Rosenthal? Trevor Rosenthal did not have the best weekend against the Chicago Cubs. Nor is Rosenthal pitching like we’re become accustomed to seeing from him thus far in 2014, even after just 12 games. He’s made six appearances, so it’s definitely still in the small sample-size category. But do we have reason to be concerned? He has four saves — so if that’s what matters to you, then he’s just fine. He has one loss, which came Friday night in the 11th inning to the Cubs. He retired the Cubs in order on six pitches in the 10th; was kept in the game to bat even with runners on first and second in the bottom of the inning; then gave up a lead-off double to Nate Schierholtz who was sacrificed to third, intentionally walked Starlin Castro, got the second out via a popped up bunt and then allowed a three-run homer to Welington Castillo before Darwin Barney lined out to right to end the inning. All of that on 16 pitches, for 22 total in the game. Yesterday was another battle, as he entered the top of the ninth with the Cards up 6-3. A strikeout of Castro was followed with a triple by Junior Lake and a single by Mike Olt, then he hit Castillo. His command is not what it’s been previously, nor is his efficiency — he threw 25 pitches to get the save. Also not what it’s been previously: his velocity. The average speed of his fastball this season is 96.11, according to Brooks Baseball. Last April it was 98.29, last October 98.23 and the lowest it’s ever been in a month is 97.76 last September. The hardest he’s thrown a pitch this season is 98 mph, and that was just once — yesterday when he hit Castillo. Otherwise, 97 is the max. And obviously the results are different too. In 7 1/3 innings total, he’s allowed seven hits and six earned runs with eight strikeouts. The only time he’s faced the mininum three batters for a save was during the Cardinals 1-0 Opening Day victory in Cincinnati. What’s bringing about the change? Is there an issue with his shoulder or his arm that’s not being mentioned? He might not be worried. But for the rest of us who’ve had to watch him thus far in 2014, it’s a bit of a different story — at least as far as the hittable pitches that are being thrown, and the results that follow. Just a reminder that entries are being accepted for the giveaway of the 2011 World Series Game Six DVDs until tomorrow, April 15, at 7 p.m. Central Time. Details are here. This entry was posted in 2014 Cardinals and tagged Trevor Rosenthal by Christine Coleman. Bookmark the permalink.